This concentrated wine has nice depth and integration, and had flavors of pear, butter and spice. It makes an excellent accompaniment for grilled white meats, salads, and seafood. 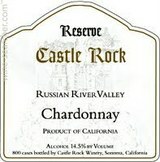 Our Castle Rock Reserve Chardonnay is made from grapes grown in the Russian River Valley, one of California's most prestigious growing appellations. Here, the fog-cooled climate and well-drained soils provide ideal growing conditions for grapes which produce some of the finest wines in the world.